Grace has a secret with the power to unhinge her precariously balanced family. Years of repressed anger and buried grief have forged a fault line through the McLaughlins, an Irish American clan whose dysfunction simmers under a patina of carefully controlled propriety. Now the unthinkable has happened: Grace is pregnant out of wedlock, the father of the baby is nobody special, and she’s planning to keep the child. As the scandal reverberates through the family, each member is forced to a reckoning point: will the wreckage of their past and the deafening silence of their present strangle what little sense of family bond remains? Only one woman, Grace’s grandmother and the clan matriarch, Catherine McLaughlin, has a plan. In Grace’s unborn child, Catherine sees the potential of a brand new life to resuscitate her failing family, dispel the ghosts that haunt her waking hours, and unlock the decades of stunted dialogue that have squelched them all. Meanwhile, as her pregnancy winds to its conclusion, Grace searches desperately for a path that will lead her to herself after years of relying on the comfort of strangers for fulfillment. 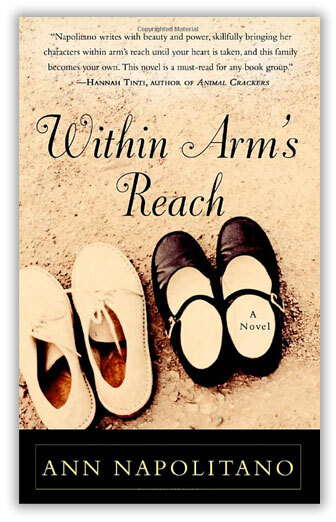 Lyrical and satisfying, Within Arm’s Reach skillfully taps into the guilt, loyalty, betrayal and misunderstanding that preoccupy and distort families. Told from six points of view, this unforgettable first novel traces three generations as they grapple with their commitments to both the living and the dead—and explores the often beautiful improvisation necessitated by crisis. 1. The novel opens with Gracie’s version of the harrowing day her grandfather threw his stillborn twin infants in a trashcan, first carrying them past his four horrified children. Gracie goes on to say, “The story of the twins’ birth is a strange comfort to me.” What does she mean by this? Throughout the rest of the novel, Gracie identifies consistently with her grandmother—even, at times, worships her. Why, then, does this opening passage focus instead on her grandfather? 2. Catherine claims she stayed home with her parents late into her young adult life because “It seemed clear that I would have to give up my entire life in order to prove I respected my mother. And I was prepared to do that” (p. 17). Why does she feel respect for her mother requires such dire proof? Does Catherine ever forgive herself for failing in this mission? How does the encounter between the two women during Catherine’s stroke alter the dynamic between them? 3. Gracie describes her passion for her job this way: “I love to come up with the right phrase, and to pinpoint the stories that have made people who they are. I enjoy working out other people’s problems. I like to come up with the final word, the right answer, and to see that printed indelibly in black and white” (p. 6). Yet as her pregnancy evolves, Gracie loses her knack for “the right answer,” and her boss begins rewriting her column behind her back. What is the symbolic significance of this shift in Gracie’s power of perception? Does the author present the change as a loss, or a gain? 4. Louis struggles with “something inside me that keeps me from reaching out, keeps my wheels from turning in the direction they should. That something is rock solid and unmovable, and it sits on my chest. It makes me sink down on the couch, sink down in the grass beside Eddie’s still body, sink down under the heaviness of the air in this room” (p. 33). Does this “something” transcend Louis’ depression over Eddie’s death, and over his contentious marriage? What else is at play in his crisis? To what extent does Louis recover in the course of the novel? 5. The great pathos of Gracie’s character is that she only feels whole under the gaze of strangers: “I always go back to wanting the same thing: to…sit next to some strange man at the bar. I want to sip beer and flip my hair and feel my eyes come alive under his gaze. “I know who I am in those moments. I recognize my reflection in the eyes of men who are interested in me. They have to be strangers, and it only lasts the first night, but it is the most wonderful night” (p. 37). Does Gracie ever fully kick this addiction? Is she able to recognize herself without assistance by the end of the story? What effect does Grayson’s gaze have on her? 6. Lila soothes herself by reading about epidemiology and fantasizing about contracting a chronic illness: “I am a fan of these kinds of diseases, which are vague in their symptoms, heavy in fatigue, capable of blurring the edges of the people they strike. These illnesses dull everything—personality, skills, drive, memory.” What is Lila trying to escape? Does she read as a tragic figure, or as comic relief? Is her relationship with Weber a sign of healthy transition, or an embrace of the kind of oblivion she has watched her sister achieve around men? 7. Catherine convinces herself that “the visions I’ve been having are a gift from Patrick…He had always seen things…now he has given his sight to me (p. 58). However, the vision of the Ballen children tied to a tree is terrifying enough to qualify as a curse rather than a gift. What do the children represent? Is Catherine eventually able to untie them in some way? 8. Kelly has passed on to Gracie a heavy dose of Catholic guilt. While Gracie recalls that her abortion left her with “a very Catholic ache that told me I had sinned” (p. 46), Kelly struggles with the morality of her affair: “I want to believe that what Vince and I are doing is decent and right and pure…but the Catholicism that I grew up with, that I raised my children with…rears its ugly head when it smells guilt” (p. 243). Both women’s guilt stems from a perceived misuse of the body, and both ironically seek redemption through fulfilling their bodies’ needs. Where else does the author comment on the conflict between Catholicism and sensuality? 9. Each character in the novel has a unique and specific relationship to death. Kelly, for example, blames the memory of her sister’s death for her enduring sense of shame and anger within the family. How does the author use death as a vehicle for character development, and to set up the impending birth? 10. Catherine’s dead mother reprimands her for instilling in her children a guilt-inducing and unrealistic sense of self-reliance: “You thought you could control everything, and make happy endings all on your own. You taught your children that that was what was expected of them. How could you do that? They thought they had to make their own lives right with no help or good luck or charity, and that if anything went wrong, it was their own fault…They all think they’ve failed you, and just plain failed life” (p. 303-304). Is this a fair assessment of Catherine, or is her mother, in turn, holding her to unfair standards? How do the two women reach a détente about their divergent mothering styles? 11. Catherine muses, “I’m not sure any child really wants to know their parent, or vice versa. Maybe that knowledge and that truth are too much” (p. 68). By the end of the novel, have Gracie, Lila, Kelly or Catherine come any closer to knowing their mothers? Have Kelly and Catherine understood their children any better? 12. What is the significance of the book’s title?